Source of Life Gold will change your life with an unparalleled Burst of Life and Burst of Health! 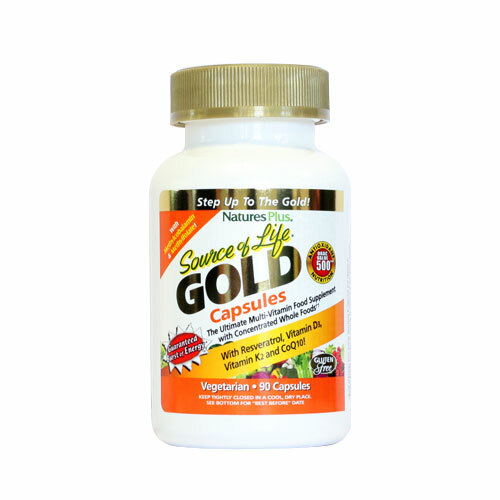 With an irresistibly delicious tropical fruit flavour, Source of Life Gold Liquid retains the innovative features, high quality and guaranteed potency of the Source of Life Gold line of supplements. Calcium prechelate (citrate, di-calcium phosphate, hydrolysed rice protein), ascorbic acid, Multi Colour Whole Food Blend*, modified starch (vegetable cellulose), Whole Food Phytoalgae & Mushroom Blend*, d-alpha tocopheryl acid succinate, bulking agent (microcrystalline cellulose), magnesium prechelate (citrate, oxide, hydrolysed rice protein), Whole Food Omega Fatty Acid & Prebiotic Blend*, calcium pantothenate, niacinamide, Enzyme-Rich Whole Food Blend*, anti-caking agent (silica), Trans-Resveratrol-Rich Whole Foods*, beta carotene, choline bitartrate, inositol, natural colour (E141), zinc picolinate, zinc citrate, lutein, coenzyme Q10, pyridoxine hydrochloride, thiamin hydrochloride, riboflavin, anti-caking agent (magnesium stearate), biotin, Panax ginseng, Bioflavonoid Whole Food Blend*, lycopene, manganese sulphate, Fibre-Rich Whole Foods*, menaquinone, sodium borate, cholecalciferol, kelp, potassium iodide, Full Spectrum Probiotics*, chromium picolinate, methylcobalamin, folic acid (as calcium-L-5-methyltetrahydrofolate), octacosanol, sodium selenite, Brassica nigra, anti-caking agent (stearic acid). CONTAINS MUSTARD. * For full list of ingredients, see contents. As a food supplement for adults, 3 capsules daily. 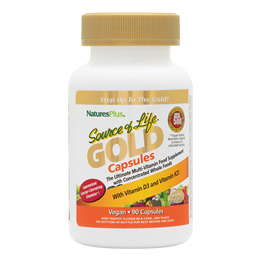 Below are reviews of Source of Life GOLD - Multivitamin - 90 Capsules by bodykind customers. If you have tried this product we'd love to hear what you think so please leave a review.